To add a payment method to the system, please follow the steps below. Please click My Property / More from the upper menu of HotelRunner panel. Please click the Payment methods from the left content menu in the More menu. We recommend you to remove the Cash payment method first if you don’t accept cash on delivery as a payment method. Please click the Add payment method button on the right hand side. Type in the name of the payment method you want to add. From the Provider section, please select the payment method you want to add and then click Save. 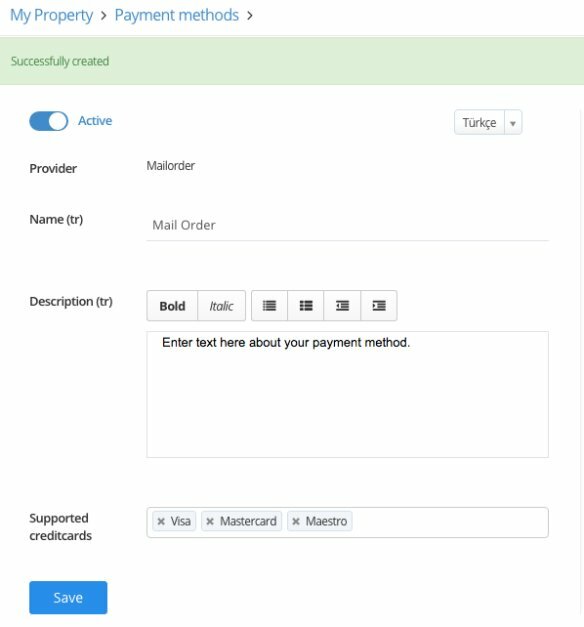 After completing the details of the payment method you have added, please activate the it from the right hand corner. After completing your actions, please click Save to save your them. If you want to add Wire Transfer as a payment method, you must add a bank account to the system.